Genetic Testing Laboratories are leading providers of health genetic testing services. Our health test covers a total of 35 different diseases. We test for diseases in many different groups including cardiovascular diseases and autoimmune diseases. All the diseases we test for are genetically linked. Our test only looks at a limited number of variants related to breast cancer. If you have a family history of breast and ovarian cancer and are looking for a clinical result to confirm if you have the disease causing variant in the gene or not then you need to order a complete BRCA 1 and 2 test. Our test will NOT provide a full gene screen and cannot be deemed a clinical result. This test is a huge leap forward in the field of genetic medicine and an ideal health management tool for those people who wish to improve their health. 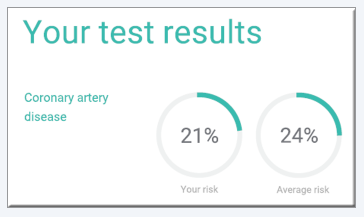 Genetic health testing has created a revolution in personalized health medicine – why not have your health evaluated with this DNA test? Scientists have identified certain gene sequences that they have singled out for the strong links these sequences have with certain diseases. These sequences that vary from person to person are called Single Nucleotide polymorphisms. Once we receive your samples, our laboratories will determine your genetic susceptibility to every disease on our list. Our broad list of tests covers the most common diseases. Your kit will be sent to you following receipt of payment. The kit contains the consent forms for sample analysis and the medical, sterile, finger lancet to collect the DNA sample. Why Test your Genetic Health? Genetic health tests are where science has really overcome a new frontier helping us move towards achieving a better standard of health and well-being. It is also a way of helping you prevent those diseases which you have a high predisposition to. You can begin making the results relevant to you by deciding on lifestyle strategies and change that will help you attain better health. Do you have a high predisposition to prostate cancer or heart disease? What is your current lifestyle like? What changes can be made to reduce the risks? Are there any regular medical checkups you should be undertaking? In cases where a condition runs in your family, you may benefit from this test by knowing exactly what your chances are of developing the disease. Our results have been scientifically validated. To read more about how genetic discoveries over the past two decades are giving rise to a new system of personalized medicine, visit Defy Your DNA, a book by Dr. Stephen B. Shrewsbury, MD.